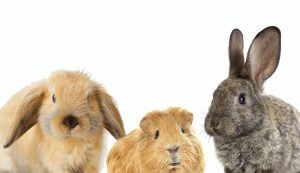 Pet rabbits and guinea pigs are now the third and fourth most commonly presented small animal species in veterinary practices in the UK. However veterinary surgeons are reported to feel there is less information available on these species, and there has been little research to identify the most common conditions affecting guinea pigs and rabbits. To identify the complaints commonly presented in UK veterinary practices for rabbits and guinea pigs, and the quantity of information veterinarians perceive to be available for each of these complaints. To find out the amount of published literature available for these two species and to compare it with the perceived amount of information available. The previously reported survey of UK veterinary surgeons, carried out in 2014, received 5407 responses of which 3982 gave information on the specific complaints commonly presented. Of these 54.5% and 17.1% replies listed rabbits and guinea pigs as commonly seen species respectively. Respondents could list up to three common conditions seen for each species – a total of 6,410 instances were noted for rabbits, and 1,974 for guinea pigs. The top three conditions for rabbits were ‘dental’ (29.9%), ‘skin’ (25.3%) and ‘gastrointestinal’ (15.2%). For ‘guinea pigs’ the top three were ‘skin’ (37.6%), ‘non-specific’ (18.5%) and ‘dental’ (17.5%). For rabbits the perception was there was ‘a lot’ of information available for only 18.6% of the complaints listed, ‘some’ for 45.1% and ‘a little’ for 30.3%. For guinea pigs the figures were ‘a lot’ of information for 4.9% of the complaints given, ‘some’ for 26.9% and ‘a little’ for 52.3%. In order to identify the amount of published literature available two searches, one for each species, were carried out on CAB Abstracts (1910-2014). The rabbit search found 7760 citations and 1086 for guinea pigs. Due to time constraints it was decide to only analyse citations about rabbits from every eighth year, all guinea pig citations were analysed. Citations not in English or which did not mention rabbits or guinea pigs in the title or abstract were discarded; this resulted in 547 citations for rabbits and 620 for guinea pigs. These were then categorised by body system using the same categories as in the survey. Of these citations only 8.6% for rabbits and 11.1% for guinea pigs were explicitly related to the pet environment; around half were related to laboratory research, and the intended audience for remaining citations was unclear. The citations came from a wide range of different publications: 234 and 250 titles for rabbits and guinea pigs respectively. Limitations of this study include the reliance of veterinarian recall of species and complaints rather than using recorded caseloads. As only citations from every eighth year were analysed from the rabbit search it is possible that the analysis does not accurately reflect the evidence base. As no critical appraisal of included studies took place the results can only provide an overview of quantity and not quality of the information. This study shows that the amount of information available for the most common complaints for rabbits and guinea pigs appears to be less than veterinary surgeons perceived there to be. Whilst guinea pigs and rabbits are frequently seen in veterinary practice the evidence-base available to support decision making appears to be limited with a mismatch between the commonly seen conditions nominated by veterinary surgeons and those found in the current literature. In the absence of published research other sources of evidence (eg textbooks and CPD) will need to be used, evidenced-based principles should be applied in assessing the value of these. The lack of high quality published evidence for commonly seen conditions for these species is a cause for concern and should be considered a priority for future research.